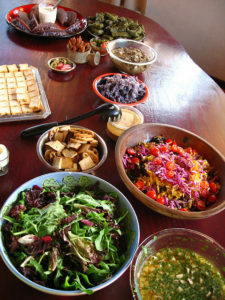 Our vegan potlucks are free for members. Non-members are welcome with a $3 guest fee, cash or check. Membership. We have place settings available for your use. All dishes must be vegan. This means no meat including poultry and fish, and no eggs, dairy, or honey. Gelatin, whey, carmine, and casein/caseinate are not vegan. Some “non-dairy” products contain non-vegan ingredients, so please check labels. Please bring enough to serve a crowd, and label your dish with your name, the name of the dish, and ingredients. Please bring a copy of the recipe to share (so attendees can take a photo of it).